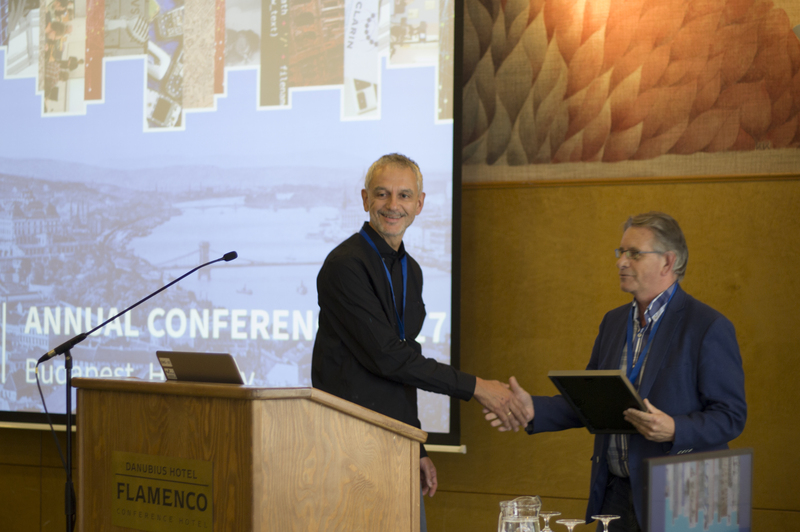 The 2017 Steven Krauwer Award for CLARIN Achievements is awarded to Paul Meurer (Uni Research Computing, Norway). Paul Meurer is both an accomplished researcher in computational linguistics and an innovative designer and programmer of online systems. In his work for CLARINO, he has developed a whole range of advanced tools and resources which are useful for the entire CLARIN community and beyond, an impressive accomplishment for one person. These systems include the COMEDI CMDI editor, the Corpuscle corpus management system, and the INESS online treebanking system with all its modules. INESS has been crucial in the development of national treebanking efforts not only in CLARINO but also in CLARIN-PL, and has supported the management and dissemination of treebanks from a wide range of other projects. Paul has gone to great lengths in adapting the system to many formalisms and formats, and has been very responsive in implementing feature requests from dozens of researchers. Moreover, Paul has implemented a tagger with lemmatizer and named entity recognizer for Norwegian, and various language resources and tools for Georgian and Abkhaz. He assisted researchers in the construction of language resources for several other languages, such as Wolof and Tigrinya. His work has significantly contributed to many research projects, e.g. on parallel grammar development (ParGram), machine translation (LOGON), and termbanks (KBN). On a scientific level, Paul has made significant contributions on several dimensions that extend our understanding of descriptive, mathematical, and computational linguistics. His empirical investigations of Georgian, for instance, have been embedded in comprehensive formal models. The computational tools and grammatical visualizations that he has developed, such as those in INESS, have enabled other scientists to make more rapid progress in their own descriptive research. His sophisticated technology has enabled the production and exploitation of datasets that can support the creation of machine-learned models of language based on richer representations of grammatical relationships than are encoded in conventional, weaker annotation systems. On a technical level, he has found innovative solutions to many challenges, such as discriminant computation from packed trees, regular expressions on suffix arrays for fast reverse index lookup, text preprocessing to resolve OCR errors, integration of the CLARIN AAI, online editing of dependency graphs, and many aspects of interactive visualization in online interfaces. The committee is impressed by the depth and breadth of his interest and achievements. He comes through not only as a first-rate scientist but also as a creative and innovative developer and a dedicated supporter of the CLARIN infrastructure. Paul Meurer clearly made an outstanding contribution to CLARIN, and therefore fully deserves the 2017 Steven Krauwer Award for CLARIN Achievements in recognition of this. The 4th edition of the award ceremony took place at the annual CLARIN Annual Conference in Budapest, Hungary. The Steven Krauwer Award for Young Scientist Award was initiated in 2014 and as of this year. As of this year, nominations could also be made for the Steven Krauwer Award for CLARIN Achievements. The awards, named in honor of Steven Krauwer (the first executive director of CLARIN ERIC) are given annually to outstanding scientists or engineers in recognition of outstanding contributions toward CLARIN goals in the areas of language resource building, tool or service development, exemplary use cases, user involvement or knowledge sharing. Apart from the honour the winners receive an official certifcate.